Garden Room With Veranda | Delivery & Installation Incl. Our Pavilion Garden Room has a dual-pitched roof to give a lofty feel inside, as well as the wonderful addition of a sheltered veranda across the front, allowing you to enjoy both the comfort of inside and the freshness of outside. Perfectly suited to year-round use, this is an ideal entertainment focal point, relaxation or hobby room. 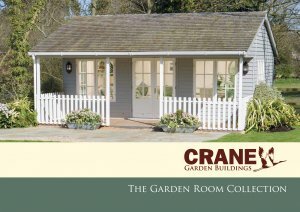 To design your own ideal Garden Room, please click on the Create my Garden Room tab below. 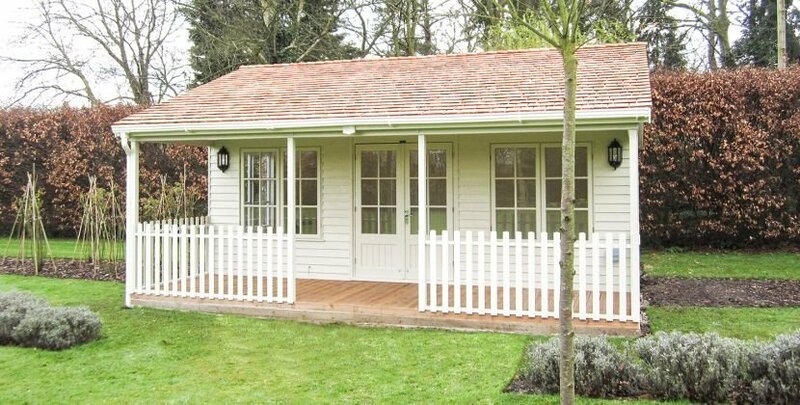 To afford a light and airy feel our Garden Rooms come with 4 sets of windows. The windows are all double glazed with 4mm toughened safety glass, they are all opening, and are finished with polished brass or chrome furniture and fitted with draught excluders. 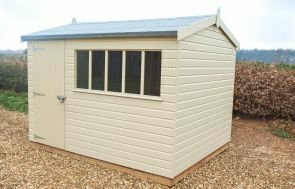 Our Garden Rooms come with your choice of roof covering: select either Cedar Shingle Tiles or Slate Effect Roofing Tiles in terracotta or grey. Both of these roof coverings add longevity to your Garden Building, they don't require much maintenance, and they are attractive and sit harmoniously in outdoor settings. We use only the finest quality Canadian Blue Label Cedar Shingles expertly tiled by our own skilled craftsmen to give a traditional finish which will 'silver' with age. They are expected to last 25-35 years and they complete the look of your Garden Room. 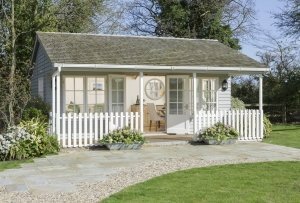 Our Garden Rooms are available in one of two paint colour ranges: Valtti or Farrow & Ball. Both of these paint ranges offer an opaque finish with a long re-decoration cycle in a wide range of natural colours that will fit perfectly into garden environments. Please see below for information on both paint ranges. 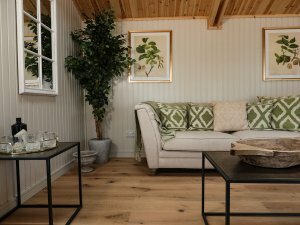 All our Garden Rooms are fully lined and insulated (walls, ceiling and floor) as standard. This allows you to use your new building all through the year, it also increases comfort and decreases noise levels, as well as finishes the building in a beautiful manner. 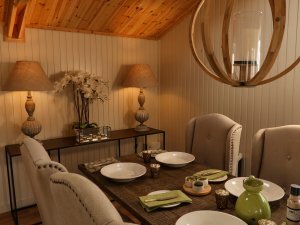 There are then 2 options for lining your Garden Room: natural matchboarding, or painted matchboarding. To have it painted, you can choose our own Ivory internal paint colour, or choose between 5 Farrow & Ball paint colours. We use a channelled, secret-nailed, tongue and groove matchboarding (15mm) with 3 coats of paint in Ivory, which achieves a bright, clean and airy look. 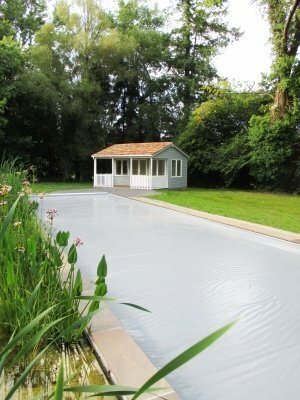 Having a lacquered floor is included in the price of our Garden Rooms. The lacquer is applied to the floorboards in either Natural or Light Oak to help protect the timber, as well as giving it a nice sheen. For lighting and using any equipment in your building, you will get an electric pack with a heater included with your Garden Room to enable you to use it all year-round. To add extra versatility to your Garden Room, we also offer the option of adding partitions. You can have an external-access partition, which is generally used to add a storage or pool pump room, or you can have an internal partition or partitions, allowing you to add extra rooms, such as a toilet, or or changing room that can be accessed inside. To finish off your Garden Room, you can also opt to have guttering to help catch excess rainfall off the roof, and choose to have Velux® windows in the roof to allow extra natural light inside. Velux® windows can be fitted in the roof of our Garden Rooms to help allow more light into your building. These are especially helpful if the building is to be installed in an enclosed area, to allow light in through the roof. Construction - ex 19mm x 125mm shiplap or weatherboard cladding on ex 38 x 75mm planed framework, all using high grade Northern Scandinavian Redwood. The walls are lined with a breathable paper membrane and insulated before being internally clad with ex 19mm vertical tongue and groove matchboarding, with a choice of either a painted or natural finish. Veranda - On buildings 3.6m wide and under, you will get a 1.2m deep veranda, and on buildings larger than 3.6m wide, the veranda will be 1.8m deep. All buildings sizes include the size of the veranda. Roof - ex 19 x 125mm tongue and groove matchboarding on solid timber rafters, fully insulated and finished in cedar shingles or slate effect tiles. Doors - 1 pair of joinery-made double doors 1830mm high x 1380mm wide, 3/4 glazed including double glazing with 4mm toughened safety glass, and finished in a range of styles (plain, leaded or Georgian). They doors are also fitted with a 5 lever mortise lock, and finished in either polished brass or chrome fittings. The doors are then set on an ex 75 x 75mm planed door frame. Windows - 4 double sets of opening windows that are double glazed and fitted with 4mm toughened safety glass, finished in a choice of styles and furnished with with polished brass or chrome furniture, in joinery-made frames. Floor - The floorboards are insulated underneath and either treated with a Natural or Light Oak lacquer as standard, or you can choose to have our engineered flooring. Looking for a different traditional style? Looking for more of a modern building?